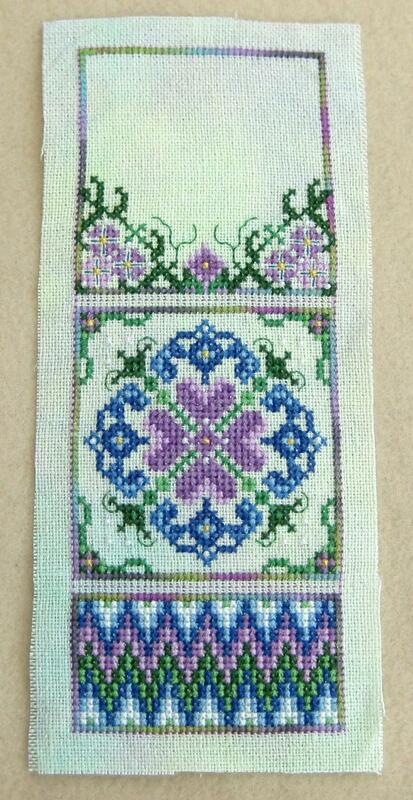 As I’d hoped, this little cross stitch project is progressing quickly, so it’s keeping my interest. 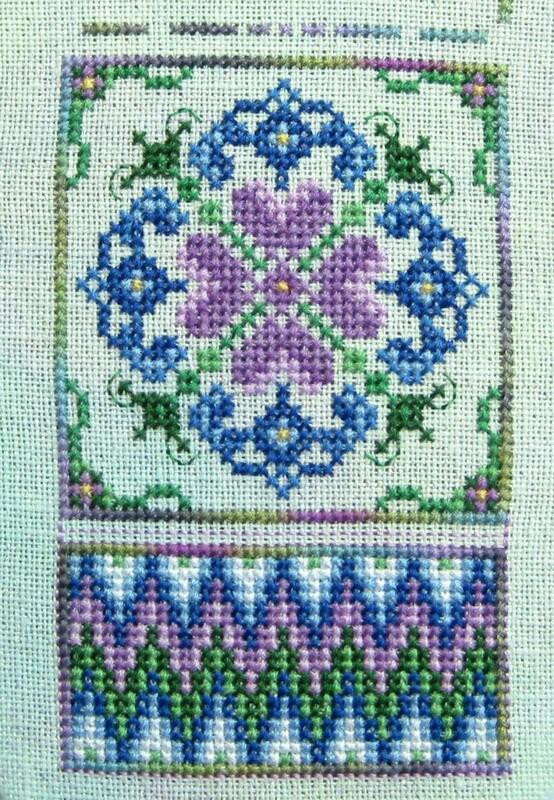 The cross stitch on each panel can be completed in a couple of (longish) evenings. 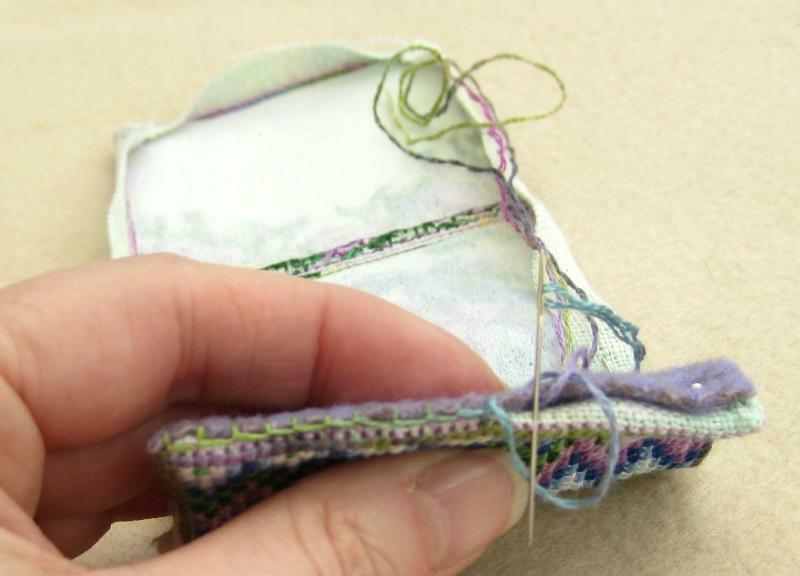 Each panel is then backstitched around the edge using fuchsia pink – this bit is important, as the backstitching is used in constructing the pocket. The yellow Symrna crosses and tiny opalescent beads finish off the cross stitching really well, and then I’m back to my non-favourite bit….assembling it! 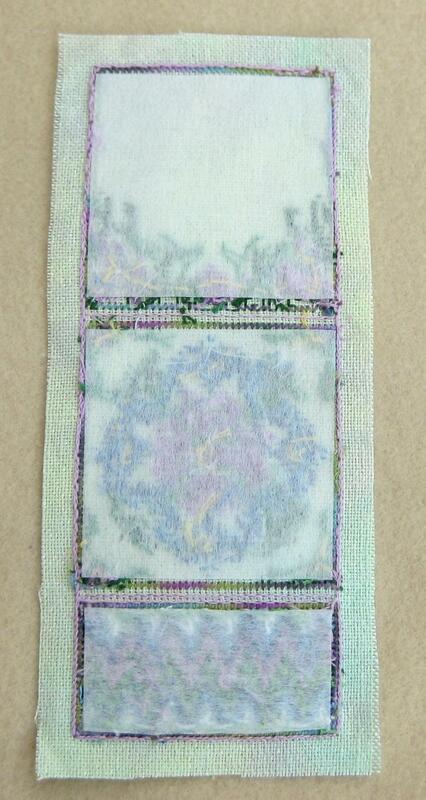 I cut pieces of iron-on interfacing, to fit just inside the backstitched outline on each of the three panels. Then I finger-pressed the spare fabric to the back, and mitred the corners of the seam allowances (quite loosely), tacking them in place for now. A tricky part was attaching the houndstooth check wool fabric to the smallest of the three areas of stitching with buttonhole stitch, carefully concealing the seam allowances as I did so – I seemed to need four pairs of hands to hold everything together as I did this, which I wasn’t expecting, but it worked out OK in the end. Wonderful photos and impressive handwork! Thanks for sharing, great idea for small gifts. The pocket is beautiful. The colours are gorgeous, the pattern pretty. Thanks for taking time to show how it is constructed. Very helpful to a novice. Beautiful! Thanks for showing the construction as well. I can see how an extra hand or two would have been helpful.